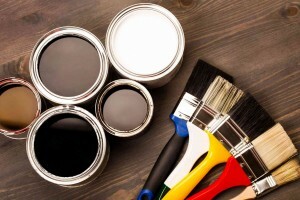 Don’t make these mistakes with your next painting project! Painting can be a fun yet stressful home project all at the same time. Following a thorough process can help ensure that your work will be completed to a high quality with all your efforts resulting in a beautiful finish that enhances your interior design. Be careful to avoid these painting mistakes so you can get back to enjoying your home. Don’t try to get ahead on your schedule by skipping the preparation stage. You might think that some of these steps are unnecessary, but they make a large difference in your finished project. Some people try to save themselves time and money but what you’ll be left with is a surface that doesn’t look its best. Take the time to clean the surface and ensure that old paint has been scraped off. If you have used a patching compound on any spots, make sure that it has time to dry completely before starting your painting project. Finally, don’t underestimate the value is using a primer first to cover any remaining flaws on the surface and ensure a long-lasting finish. We all know the saying that you get what you pay for. Although you may be saving money initially by going cheap on brushes and rollers, you’ll end up investing those funds at a later time by fixing what those tools couldn’t provide. Quality brushes and rollers provide excellent coverage, which saves you time, and those tools can be used again for your next project. Also, using actual painter’s tape instead of masking tape provides the sharpest lines possible. Remember that high-traffic areas need more than just flat paint. Be sure to use durable paints like a premium matte finish that can withstand the rough traffic in a specific room, like your dining room or kitchen. Another great tip is to use washable satins or semi-glosses. Paint has the best chance at durability and long-lasting performance when the surface has just a bit of texture. Therefore, instead of adding a new coat of paint directly on top of an existing layer you should use sandpaper on the surface. Follow that step with a light rinse with clean water. It’s important for painting projects that you have a planned course of action. You can easily find yourself aimlessly painting without the proper plan in place. Start near the ceiling and paint in a downward direction to achieve the smoothest finish. This allows you to catch drips while you’re painting.